Sorry for the delay, but life just got a bit hectic this week. Here are a few more photos from last week's quilt show. Needless to say, with everything else going on, I didn't get much done in my work room this week, again! I'm really hoping things will settle down and I can get back to my work room next week. In the meantime, here is a photo of another design of mine. 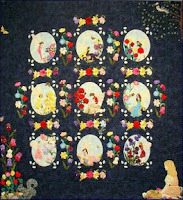 This one is called"The Fairies At The Bottom Of My Garden" and I designed it in 2001, and published the patterns in 2002. I did a bit more embellishing on this one using beads, threads and crystals.